I like to try new things. When I lived in Virginia, I took sailing lessons on the Potomac River. In Maine, I went toboganning and in New Mexico, I got certified as a rattlesnake wrangler. 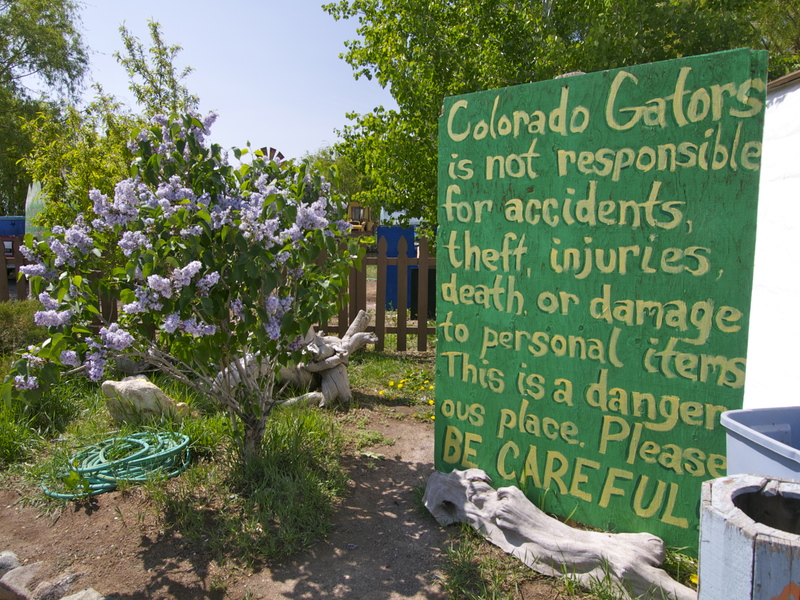 So a few weeks ago when I visited Colorado Gators in Mosca, Colorado and heard they offered an alligator wrangling course, I signed up. Alligator wrangling isn’t the sort of thing you do by yourself, so I also signed up one of my more reckless adventure partners, Drew, calling it his 29th birthday present. 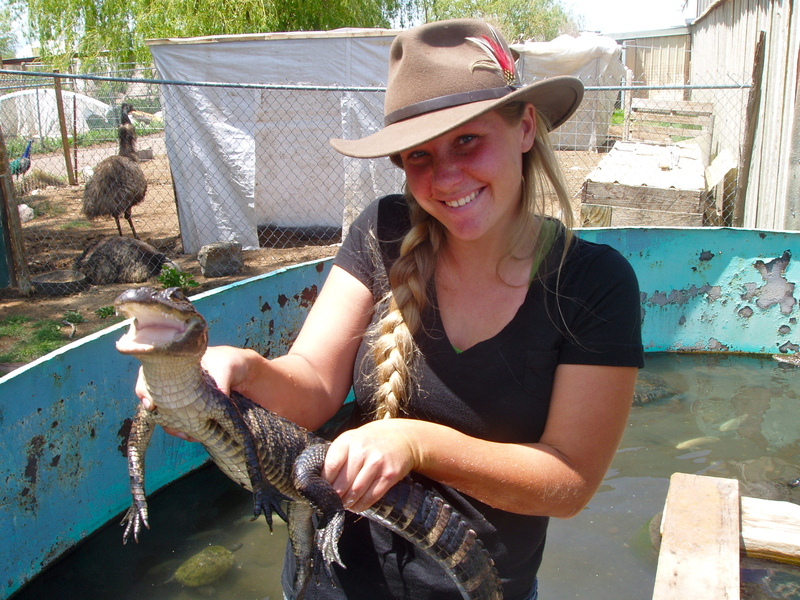 Alligator wrangling is as wild and foolish as you might imagine. The fact that there is a place in this obnoxiously litigeous country where you can sign a single sheet of paper, wade out into a stew of gators, grab one by the tail, haul it thrashing onto the beach and then leap on its back makes me proud. I thought you had to go to South America for this kind of no holds barred fun! Joe grabbed the biggest gator in the pool by the tail and dragged it backwards through the water onto the beach. The gator lit up at Joe’s contact, thrashing back and forth with such force, it was a wonder that he held on without dislocating a shoulder. Each time the gator threw her body to the side, Joe responded by jumping the opposite way, always staying at the end of her tail. “Stay away from the mouth,” was his instruction. No kidding. Joe walked out onto the deck and before I could lift my camera, right as Drew said “No way!”, he hurdled the railing and fell ten feet down off the deck, into the water, onto the alligator’s back. The water erupted. All we could see through the spray were teeth, tail, and Joe’s black leather hat, holding on. After riding the furious alligator around the pool for a couple of laps, she finally let up enough for Joe to get his rope around her neck. Then he waded to the shore and called us over to help him pull her onto the beach. Totally thrilled to have wrangled my first gator! 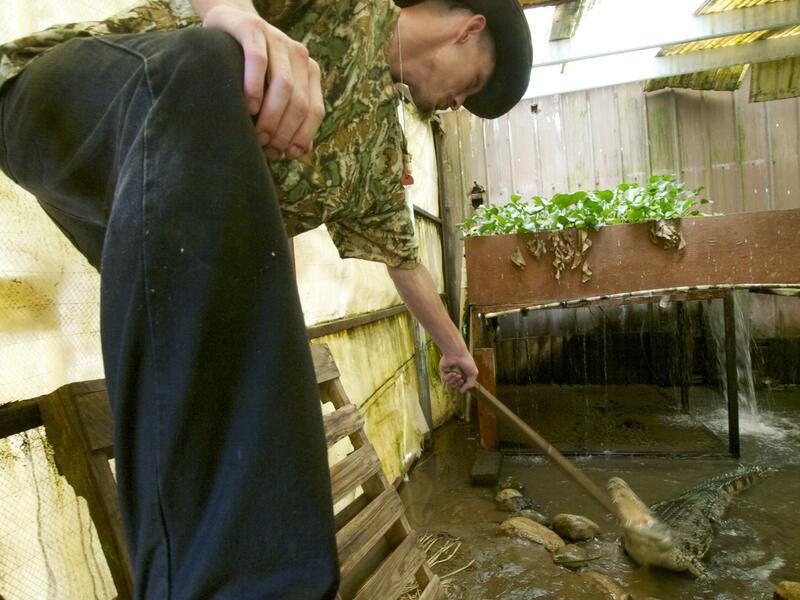 Colorado Gators calls this class “the world’s only alligator wrestling course”. To Joe’s knowledge, nobody else offers this kind of hands on experience. 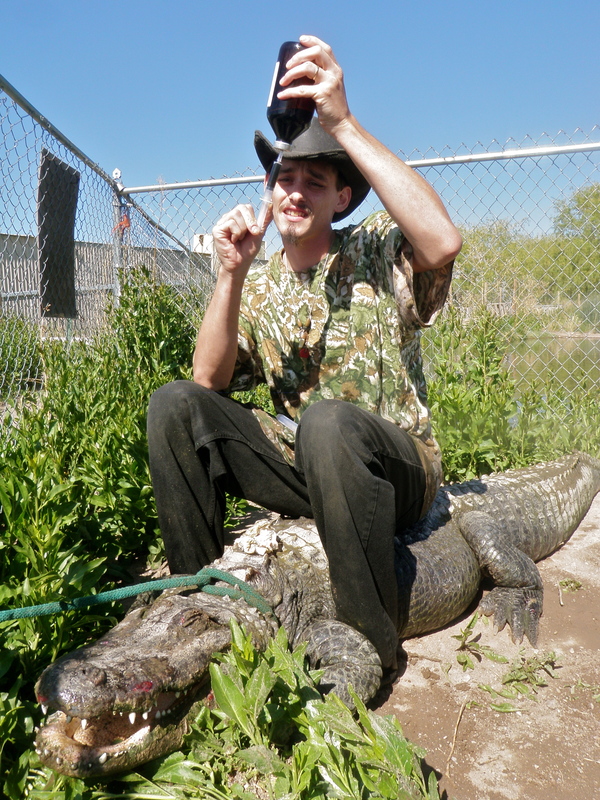 The $100 price includes a 3-hour private class, a CD of dozens of photos (all the photos of me with the gators were taken by Joe) as well as a very official “Certificate of Insanity”. Best $100 bucks I’ve ever spent! 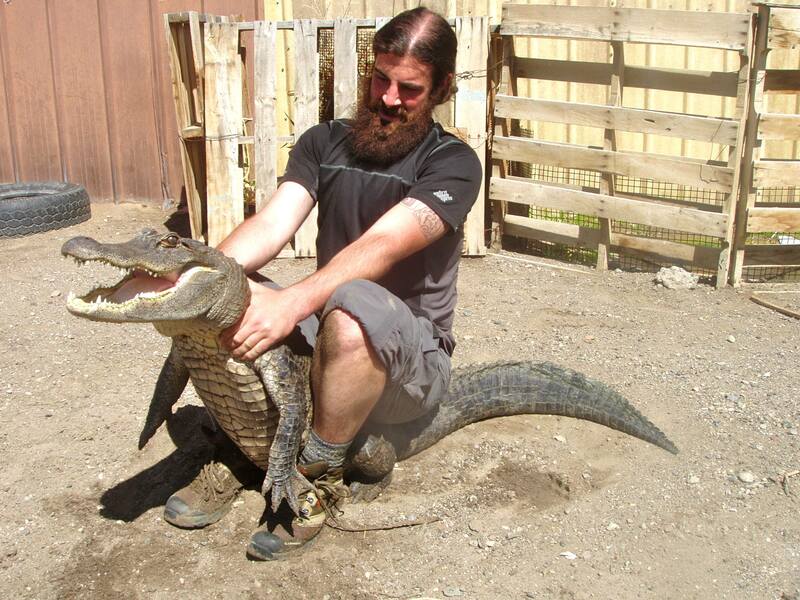 To sign up for the world’s only alligator wrestling course call 719-378-2612 at least a week ahead of time. Classes are offered every day of the week. In early August the farm will hold their annual “Gatorfest Alligator Rodeo” where former students compete for biggest gator bragging rights. You must have completed the handling course and take a refresher to compete. Too bad I’ll be in Alaska in August. Next year! Wow, what an adventure! My hat is off. 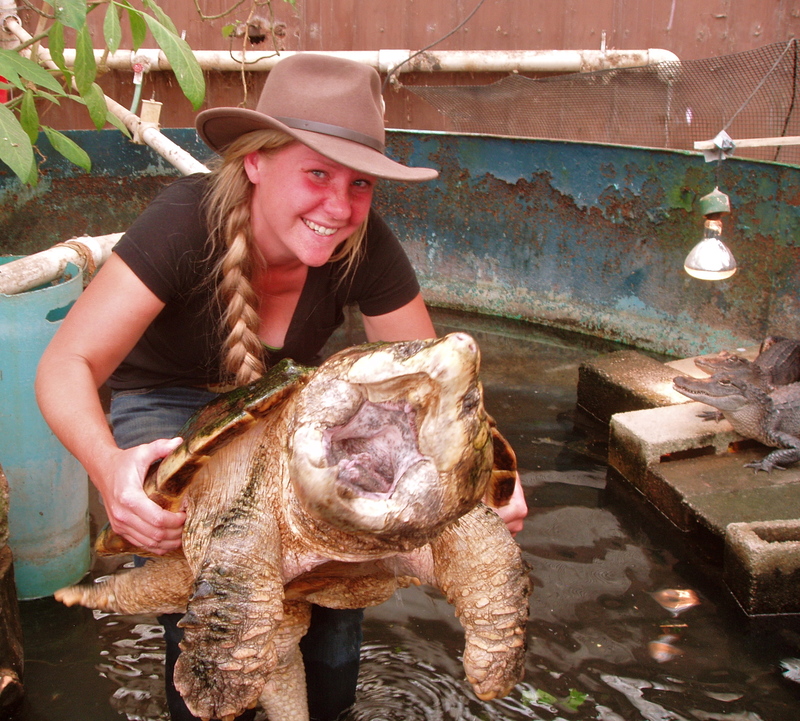 Looking at the photos – I think I’m more frightened by the snapping turtle. 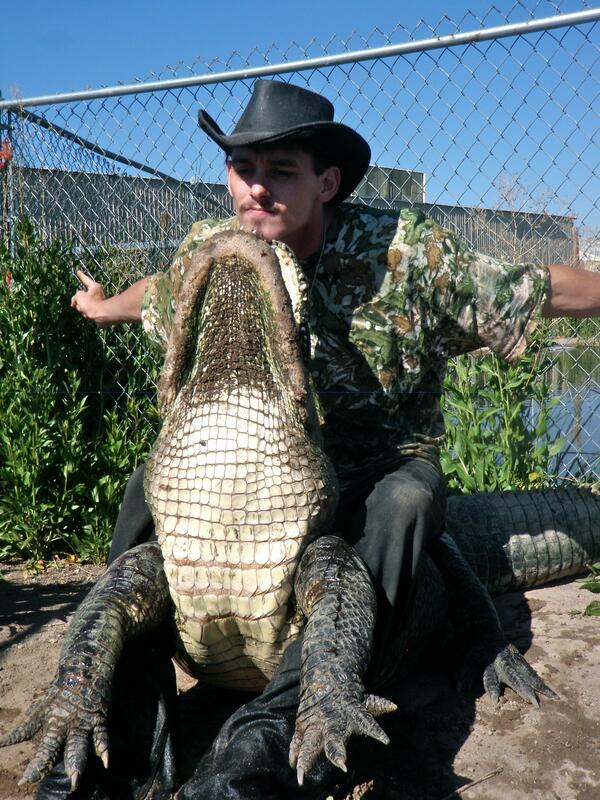 That might be because I have been exposed to them, but never touched a gator (unless you count boots, purse, or po-boy). Seen some big-uns north of New Orleans, though. Saw one that looked like a dinosaur. Wow! 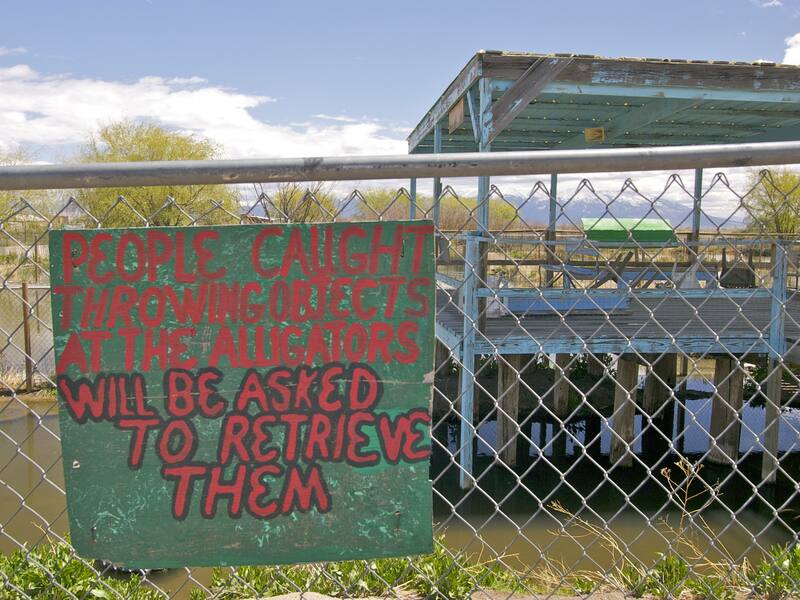 Gators in Colorado. Go figure. And a brave girl you are. I’ve been reading your blog ever since a friend gave me the link. You are awesome! 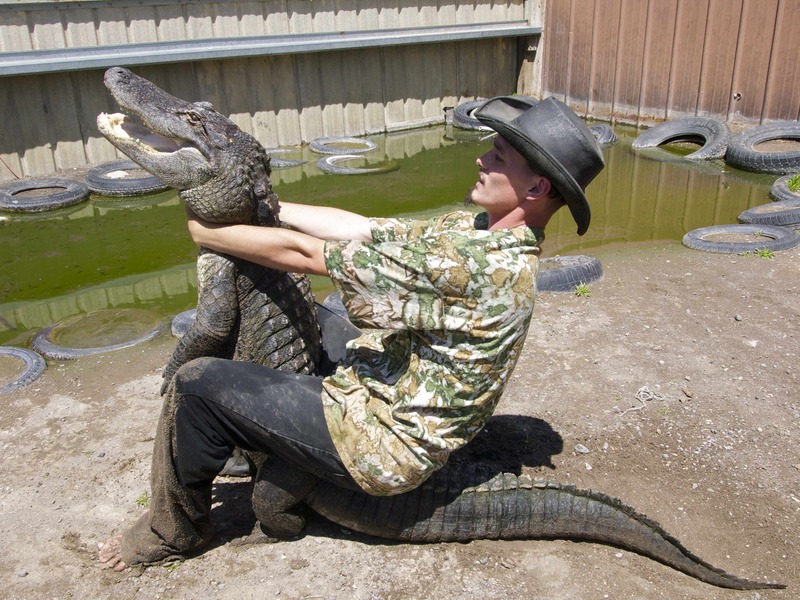 I can’t believe you wrangled alligators. Reading this had me grinning from ear to ear too. 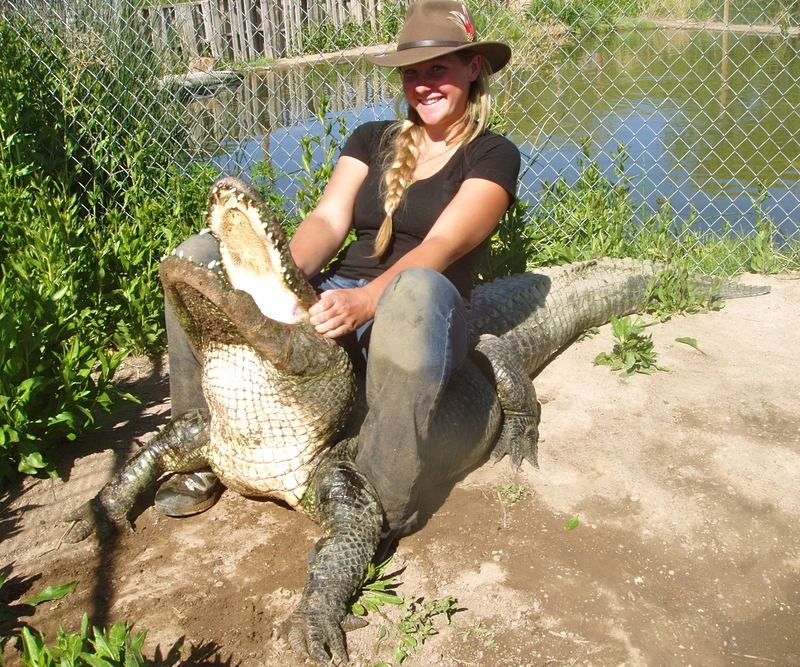 Great job wrangling them gators girl! Wow, u need a medal or some thing, this was wicked…. OMG These are some classic shots that I’m sure you will long remember. I celebrate your….well….craziness. Living life to the full is grand and we get to see pictures. Life is good. That’s sweet! Way to get after it. When you take little side detours like this one, what do you do with your dogs? My husband and I have a summer of traveling planned with our truck and a tent – and our two dogs. I worry that it will be too hot to leave the dogs in the truck for some things we want to experience! Great question! But I’m not sure my answer will help you all that much. When it’s too hot for the dogs to wait in the car (over 65 degrees in full sun) I put them in the Teardrop. It doesn’t get hot the way the car does and with the skylight and windows open, it makes for a very nice rolling dog house. Before I had the Teardrop, traveling with the dogs in the summer was tricky. Usually, I just planned to drive in the heat of the day and do things that didn’t involve the dogs in the early morning and evening. My dogs are also good about being tied somewhere so if there’s shade and I can keep an eye on them, that was sometimes an option. Does your truck have a camper top? Those are usually pretty dog friendly, especially if it has screening on the sides to allow for airflow. A reflective windshield screen can make a big difference in the temp of your car too. Don’t take chances though! Cars get hotter faster than you might think. When I worked at the vet hospital in college we had a few emergency cases come in and they were always so heartbreaking. Love this post! 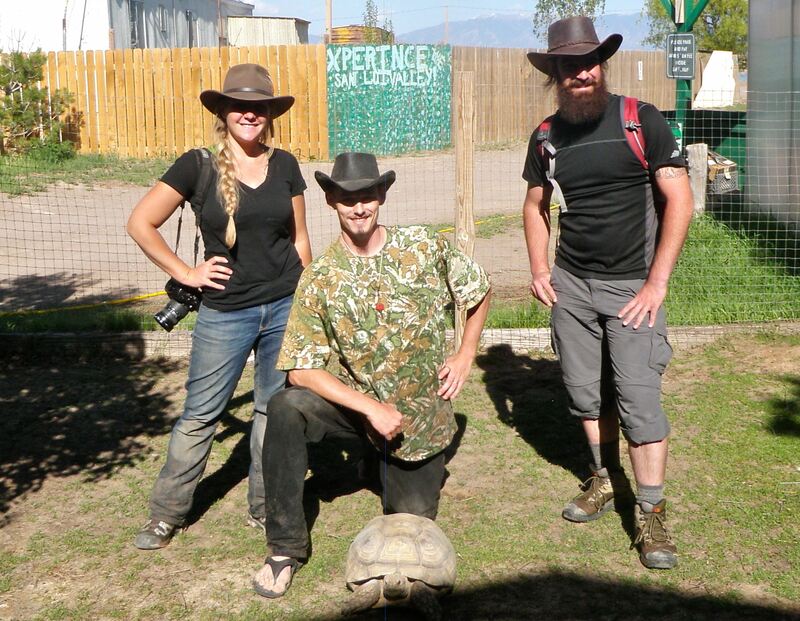 Awesome adventure. Whoot Whoot!!! Sounds like a great day was had by all….maybe not by the embarassed Gators, but that’s what they get for free food. WOW, and I thought I did crazy stuff ! This is an absolutely an amazing experience, and love your whole story and video of your day alligator wrestling. Think I’ll leave this one for the youngin’s like you. Congrats on a harm-free day! Haha thanks! It was nuts. 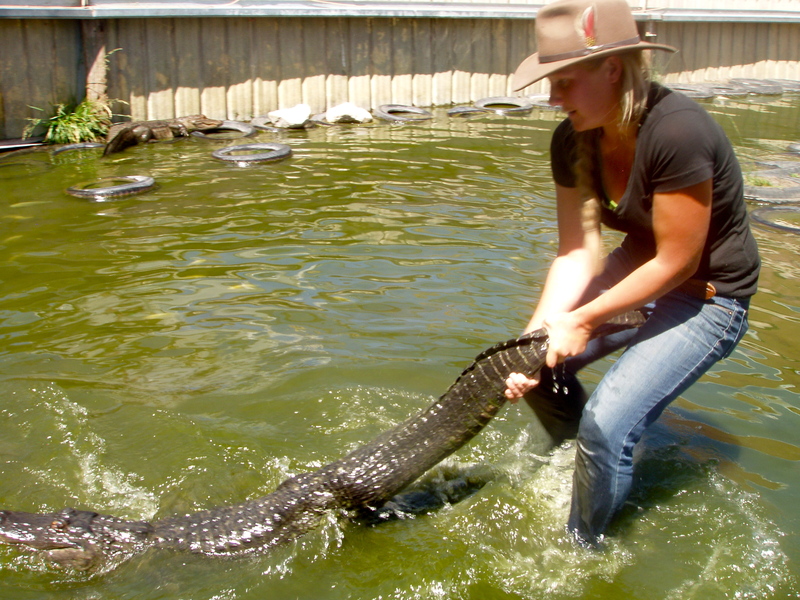 I had so much fun, but I’m not sure I’m going to make gator wrangling a new hobby! I need all my fingers! After reading your awesome blog for about two months now, you get the “coolest girl in the world award” for 2012, maybe even 2013.
and i like how none of you ever lose your hat. oh yeah boy! Hi Mary as you see I reblogged this post as I thought everyone should see the brave things you get up to. 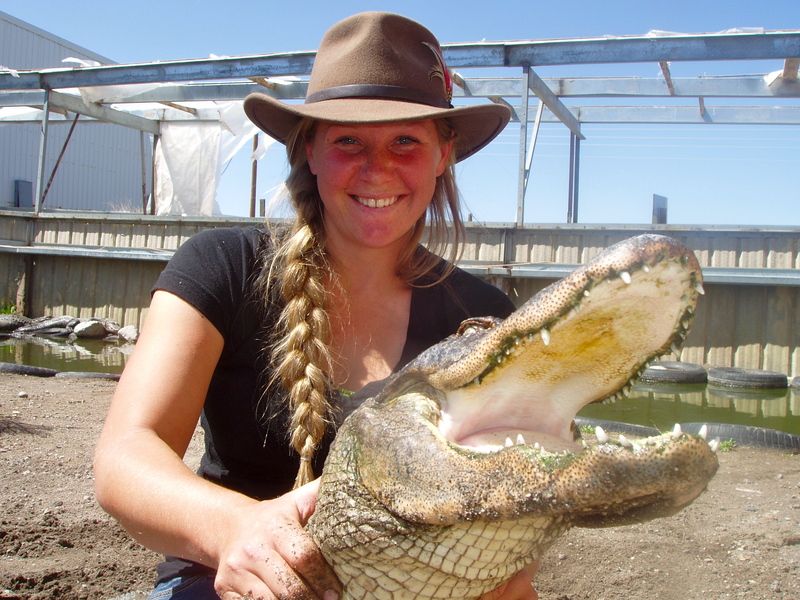 I admire your courage in trying anything to achieve your goals and this with the alligators is simply amazing. Thanks so much for sharing. Clifford and I have been to the gator farm, even had our picture taken with a little gator, but NO WAY would I do what you did! What a wonderful crazy thing – glad you had such a good time and left with all your appendages.